This past year was mainly about the new record “Big Music”. And the most memorable thing about that for me was the increasing feeling of excitement as we anticipated the reaction to the release of our latest work. Coming a whole five years after Graffiti Soul, this new work needed to demonstrate that Simple Minds had a current vitality. Not exactly a messianic quest perhaps, but reinventing your sound while also retaining the classic qualities is a whole lot easier said than done. Nevertheless, as we closed in on the finishing of the recording we became increasingly confident with the overall results, and with every passing day we became more desperate to release what we believed was as good a record as we had ever made. The year was not only about the album release however. To suggest that would be to forget that back in late spring we also had the pleasure of releasing our first in-concert film in almost a quarter of a century.That then surely figures as some kind of highlight within the ever evolving story of Simple Minds? In any case the Hydro film was obviously overdue, but a fine souvenir of where the band was at that particular moment in time all the same. Loud and proud – and with some real style, it does what it says on the tin by featuring us showing off to a home crowd in Glasgow’s brand new arena-dome. For my money, the entire team involved in producing “Celebrate – Live From The SSE Hydro” excelled, and thanks to them for that. Mostly the summer months comprised of nights spent performing live to audiences that welcomed us wherever we went. Generously they also encouraged us as we started to fill the open air set with newer songs that would eventually surface a few months later on BM. Best shows for me were Nice, Taormina, and a sultry Kew Gardens. But who knew that singing for nearly two hours on a rain soaked Linlithgow stage could deliver that amount of pleasure? One of the the biggest surprises of the year had to be the revelation that Simple Minds songs can also work extremely well within an acoustic format. I am sure that both Charlie and I are not the only ones to have been sceptical with regards to that. After all, when was the last time you heard a street busker belt out a Minds classic on a scabby looking six string? But stranger things can and do happen. And any notion of doubt was about to diminish, because after taking the plunge and debuting our acoustic treatments on Chris Evans breakfast radio show, we are now looking into exploring how to make more of that as a future project. And who wouldn’t given the results? No other words for it, people really raved about our acoustic set. We ended the year being back in Glasgow, and busying ourselves by rehearsing the first part of our scheduled preparation for next year’s tour. Sneaking out for a night to take part in BBC’s Sports Personality Of The Year, also presented from the aforementioned Hydro, was good fun and great profile for our band. As for all those athletes/sports stars who stayed glued to their seats as Waterfront blasted out? I’d go easy on them. They were most probably knackered. And who could blame them – what with all that training they do, day in and day out? And what about all that touring that we do? Touring that shows no sign of ending for that matter. Well all I can tell you is that there will be more than a hint of a “still evolving Simple Minds” when we take the stage in Lisbon around six weeks from now. And with the experience of all those shows that are due to take place over the next year, it is not too much of gamble for me to predict that the Simple Minds you might get to see this year will probably be better than ever. And if not, it will not be through the lack of trying, believe me. And with that I will say Happy New Year to all. 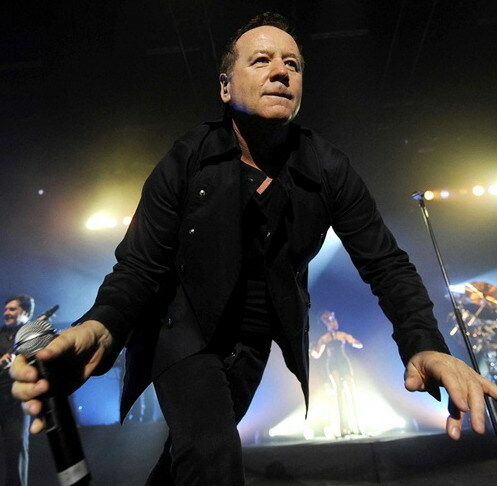 And thanks wholeheartedly for supporting Simple Minds by listening to our music and coming to our shows. We mean it!